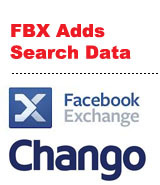 Facebook has added retargeting firm Chango to its list of preferred partners for Facebook Exchange, bringing a powerful aggregator of search intent data to the real-time bidding marketplace. The move is notable in that it represents an incursion by Facebook on the “intent currency” of Google (Bing and Yahoo too), after a period of failed efforts by the search giant to capture Facebook’s social graph data to enhance its own core search functionality and advertising. Chango maintains user profiles linked to search activity on approximately 300 million people in North America. Of the 11 official partners Facebook has added to the exchange thus far, Chango claims to be the first to bring search data of any kind to bear on Facebook’s real-time bidded inventory. Chango also offers standard site retargeting. “In this particular case, we compete with all the existing FBX partners,” Sukornyk says. The addition of a search retargeting partner to FBX suggests Facebook is still seeking new ways to bring value and money to the exchange. At the same time Facebook is being fastidious in how it approaches the certification process with new FBX partners. Several companies that were previously named PMDs for FBX are not currently listed on the company’s Preferred Marketing Developer directory. These companies say they are active nonetheless, and merely awaiting final approval to be added to the directory.